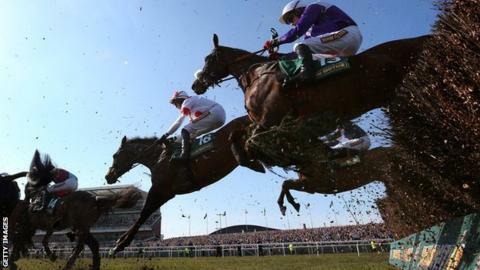 A maximum field of 40 runners is set to line up for the 167th running of the Grand National at Aintree on Saturday. More than £250m is expected to be wagered on the race, with bookmakers suggesting half the adult UK population will have a flutter. Last year's third Teaforthree, top weight Tidal Bay and 2011 Cheltenham Gold Cup winner Long Run are among the leading contenders. The world's most famous steeplechase is run over nearly four-and-a-half miles. The 30 fences include Becher's Brook and The Chair. Officials are hoping safety changes will help ensure all runners and riders return safely as they did last year. New fence structures, a slightly shorter distance and jockeys being advised to curb speed in the early part of the race are among measures introduced after two equine fatalities in both the 2011 and 2012 contests. The 13-year-old Tidal Bay, trained by Paul Nicholls, seeks to become the oldest winner for more than 90 years and the first top weight to triumph since triple National winner Red Rum in the 1970s. "His form off top weight in his last three handicaps has been very good. He is in good shape and I am looking forward to him running," said Nicholls. "It doesn't matter if he races in last and gradually picks up. He likes being ridden that way." Meanwhile, Long Run - the mount of Sam Waley-Cohen - aims to follow the Irish-trained L'Escargot (1975) as Gold Cup champion going on to complete the National double. Waley-Cohen, whose father Robert owns the Nicky Henderson-trained horse, is an amateur jockey but has the best record over the National fences of any rider in the race - with four career wins in other contests over the big Aintree obstacles. "Myself and Sam have enjoyed plenty of luck over the fences in the past, but I still get a tingle ahead of the National as it's a great race," said Robert Waley-Cohen. "Clearly he has deteriorated since his days of beating Kauto Star and Denman in the Gold Cup, but he has been handicapped accordingly. "All you can wish for is a clear run and then take it from there." Teaforthree is another being aimed at a landmark win as Rebecca Curtis hopes to provide the first Welsh-trained victor for more than a century. She said: "He took to the Grand National fences last year and likes ground the softer side of good. He looks really tight, without being over-drilled." Unlike the Cheltenham Gold Cup, where horses race off level weights, the Grand National is a handicap. Horses are ranked according to their previous form, with the best given top weight. The handicapper's ultimate (although in practice unfeasible) aim is for the horses to pass the winning post in a dead heat. The closest finish came in 2012 when Neptune Collonges denied Sunnyhillboy by the shortest possible distance - a nose. Popular other selections are likely to include Double Seven, with 18-time champion jockey AP McCoy on board, and Monbeg Dude, trained by Michael Scudamore. Scudamore, the son of former champion rider Peter, co-owns the horse with rugby union internationals Mike Tindall, James Simpson-Daniel and Nicky Robinson. Tindall bought the horse for £12,000 at Cheltenham sales after a boozy meal, and now he is racing in the National, which boasts a prize fund of £1m for the first time. His wife Zara, a leading equestrian rider and the Queen's grand-daughter, has helped supervise schooling sessions for 2012 Welsh National winner Monbeg Dude aimed at improving his jumping. Jockey Paul Carberry, who rode Bobbyjo to National success in 1999, believes he has a chance. "I've no worries about his jumping, although I hope we can get into a rhythm because he can make a mistake. "I've schooled him over Aintree fences and he respected them, so I hope he respects them on the day. I'll get a great ride if he does. "Hopefully he gets a clear run and then we can hope for the best. If he gets into a rhythm then he has a chance." Ireland's hopes of a first Grand National winner since Silver Birch in 2007 include the Willie Mullins-trained Prince De Beauchene. Katie Walsh, the most successful female jockey in Grand National history, has secured a last-minute ride. The 29-year-old Irish rider, who finished third on Seabass two years ago, replaces the injured Mikey Fogarty on 66-1 outsider Vesper Bell. The National is a handicap chase run over nearly four and a half miles, with different weights given to runners based on previous form. Read more on Grand National 2014: Where did your horse finish?